Proverbs are fundamental to the Yoruba language. Yoruba people use these poetic sayings –one or two lines of words– to convey a message with more meaning than a 30 minute conversation could accomplish. 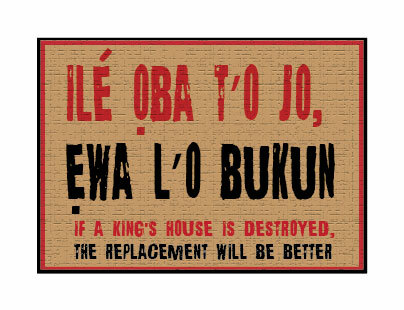 A proverb (òwé in Yoruba) can be used to give advice, give warning, express reproach or express compassion. Children start learning them from their parents, grandparents and school teachers when they are very young. Hundreds of Yoruba proverbs exist. I think they are all beautiful and fascinating to learn. When I get to Nigeria and start whipping out proverbs, believe me, the Nigerians will be astonished. I love these proverbs so much that I am going to start posting a ‘Weekly Òwé’ for everyone to learn. They are all figurative. The literal meanings don’t really make sense, but that’s how Yoruba is. It is a poetic, figurative language, something that doesn’t suit literal translations well but makes it all the more fun to learn. So I hope you find meaning in each one as the weeks go by. I chose the first one because I think it’s pertinent to the situation I’m in right now. Ki e gbadun òwé náà.